Wait for the Bulldozers or Demolish it Yourself? Self-demolition is an increasing trend in East Jerusalem. This phenomena receives little international attention as it is difficult to track, both in numbers of those affected and its psychological impact. The remains of the Haq children’s bedrooms. The family needed to wait for the authorities to verify the demolition before cleaning up the rubble. This took one month. Photo EAPPI/M. Kjellstrom. One and a half rooms is what is left of the Haq family’s house in the Ras al-Amud neighbourhood of East Jerusalem. For the family of seven, this means living shoulder to shoulder. “It is especially difficult for the older children to share,” Huda Haq, the mother, regrets. In addition to an 18-year old son and a 16-year old daughter, she has boys aged 12 and 9 and a baby girl aged 4. Since three months ago, all of the children have been living in one room. Last October, Ameen Abdel Haq was forced to demolish half of his house, an extension that the growing family built in 2009 . The court ordered the two rooms to be demolished because they were built without a permit. 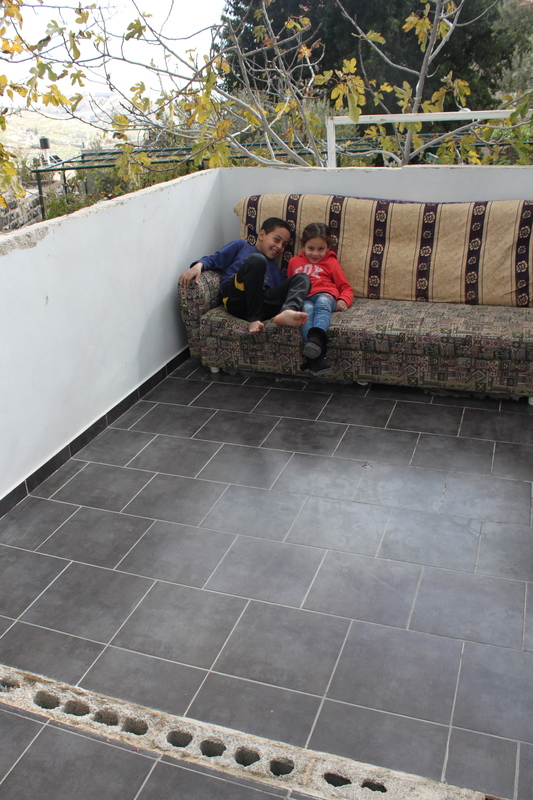 To avoid the demolition fine, a minimum of 20,000 NIS, the family was forced to deconstruct two rooms which were used as the children’s bedrooms. 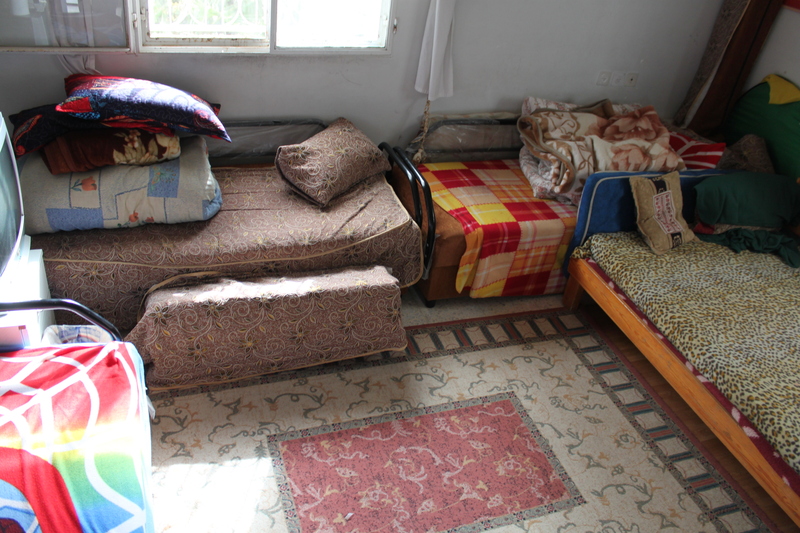 The 5 children of the Haq family all sleep in one room now. Photo EAPPI/E. Kulta. For Palestinians living in East Jerusalem it is next to impossible to acquire a building permit. The same goes for other Palestinian areas under full control of Israel, namely Area C in the West Bank. According to an Israeli peace group ICAHD, more than 94% of all Palestinian permit applications have been rejected in recent years. Waiting forever for a permit is not an option with an ever-growing population, so people build without them. Israel frequently demolishes Palestinian homes. Last year, the United Nations reported the demolition of 406 structures in the West Bank and 48 in East Jerusalem. The number of self-demolitions is a figure that is more difficult to track. There is no comprehensive information on self-demolition in official government data, which makes international attention more difficult to foster. However, according to ICAHD the self-demolition of personal property is an increasing trend. Two of the major reasons that families self-demolish are to avoid unnecessary attention and to dodge high demolition fines, Ruth Edmonds says. According to ICAHD, some families also self-demolish in order to avoid the psychological burden, particularly for children, of waiting for a bulldozer to show up at their door. Farah, 4, and Mu’nes, 9, in their now demolished bedroom. Photo EAPPI/E. Kulta. 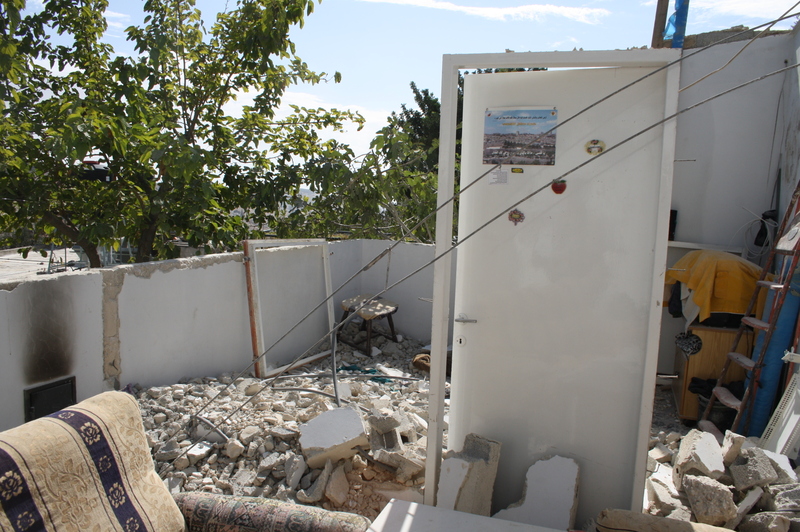 The Haq family in Ras al-Amud was given one month to demolish the newer part of their home. “We discussed the reasons with the children why we need to do this. I think it made it easier for them to accept the situation. They have not been angry,” Huda Haq explains. The family undertook the demolition together. “It took three to four months to build the rooms, demolishing them only two days,” the mother sighs. The oldest son of the family, Mohamed Haq, describes the mentality needed to carry on under the adversity caused by the occupation. *Learn more about the people affected by Demolitions & Evictions. Is it acceptable to blindfold and arrest an eleven year old? An older guy gives Ahmed support before he turned himself into the Israeli soldiers. Photo EAPPI/E. Mäkilä. On 16 November the Israeli military went to arrest fourteen year old Ahmed. According to the military he and his friend Omar, eleven years old, had thrown stones at Israeli cars passing by. Because Ahmed was nowhere to be found, the soldiers decided to arrest his father. Two members of the Jayyus EAPPI team were present at the site to witness this arrest. As one of the soldiers went into the back of one of the armored vehicles, for a brief moment one member of the EA team was able to see Omar. He sat in the car with his hands tied and blindfolded. Omar is only eleven. He was alone. He was not accompanied by a parent. One of the EAs confronted the soldiers and pointed out that this is illegal, even according to Israeli law! The soldier looked the EA dead in the eye and denied that there was a child in the car and then drove away. Ahmed’s family was told that the father of the family would not be released until they handed over Ahmed. With tears in her eyes Ahmed’s mother turned to his sister and argued that the military would anyway come at night to arrest Ahmed if they did not hand him over today. The sister wept. Ahmed himself, who returned home after the military had left, also looked really nervous when hearing he would have to face Israeli imprisonment. 14 Year Old Ahmed before he gave himself up to Israeli soldiers. Photo EAPPI/E. Mäkilä. Omar with his grandmother after he was released and returned home. Photo EAPPI/E. Mäkilä. Fortunately, both the boys and Ahmed’s were released from detention about an hour after Ahmed turned himself in. When the Jayyus EA team spoke with Omar, he explained that the Israeli soldiers had neither hit him nor threatened him. When an EA team member asked him if he was afraid during the detention he became quiet and then denied being afraid. Then the adults in the room said that it is ok to be afraid. 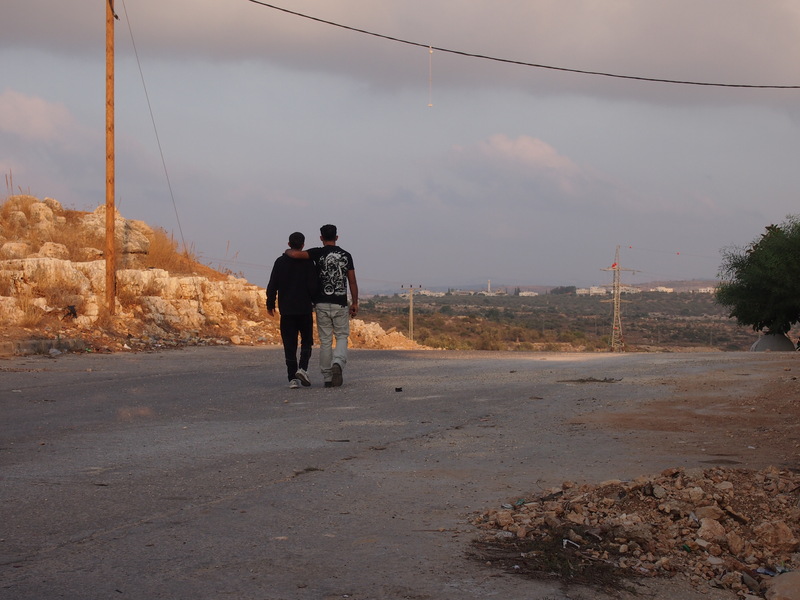 Under the current Israeli occupation Omar’s and Ahmed’s story is by no means a unique one. As EAPPI observers we have witnessed several similar cases that have led to the detention and imprisonment of a child for several months. Under the occupation Palestinian people, including children, are tried according to military law. Children over 16 years of age are considered adults before Israeli military law -responsibility before law starts at the age of 12. The UN Convention on the Rights of the Child defines a “child” to be “every human being below the age of eighteen years”. Palestinian children arrested by the Israeli forces continue to be interrogated without the presence of a lawyer or parent, and without a video recording of the sessions. The hardest thing to witness is the psychological damage and violence the occupation causes to Palestinian children and their families. Not only is this a violation of human rights and international law, but most importantly it is a disgrace towards human dignity. As EAs we have seen the sorrow of the families who cannot provide security for their children. What kind of consequences does this have on the peace process? What will the future look like, when it is built in this manner using tools of oppression, fear and humiliation? By hiding behind the law one can justify actions taken and continue breaking young minds, causing suffering for the Palestinian people, not just as individuals but for the community as a whole. 159 children were kept in Israeli prisons and detention centers on November 1, 2013. Fifteen of them are under the age of sixteen. Israeli administration detention orders empowers military commanders to detain an individual without a charge for up to six month long renewable periods if they have “reasonable grounds to presume that the security of the area or public security requires the detention.” On or just before the expiry date, the detention order is frequently renewed. This process can then be continued indefinitely. The current Israeli order of Criminal Code divides Palestinian children into three different categories – those under 12 are considered children, those between 12 and 14 are considered “youth” and those between 14 and 16 are defined as “young adults”. Palestinian children over 16 years old are considered adults before the military law while Israeli children age 18 and older are tried under Israeli civilian law. Palestinian children continue to be charged according to their age at the time of sentencing, instead of their age at the time of the alleged offense, as required by international law. This practice enables them to be sentenced as an adult for an offense they may have committed as a child if they are unfortunate enough to be charged years after the alleged offense, or simply if they turn 16 while awaiting sentencing.